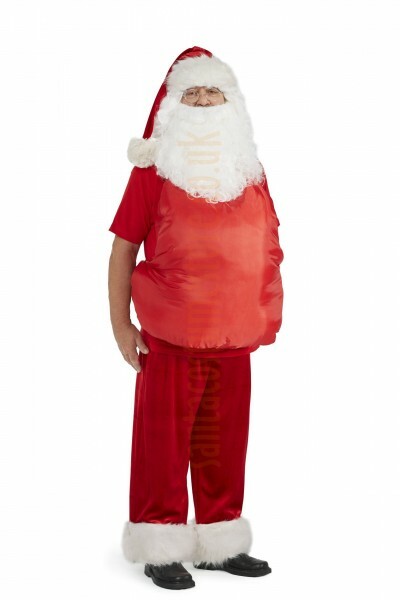 This velour Santa suit in the SUPER DELUXE version is the best choice for professionals. Excellent materials, finished with great care, and a full set of accessories guarantee that stepping into the feet of Father Christmas will be particularly enjoyable. To emphasise the suit’s class, the set includes a beautiful long beard, sturdy leather boots, and a broad belt – as well as an enormous brass bell. The full set comprises 17 parts. Satisfaction guaranteed! What makes the super deluxe version of the Santa suit stand out? A super deluxe version of the Santa suit made of high quality velour that shimmers beautifully as it reflects the lights of the Christmas tree. 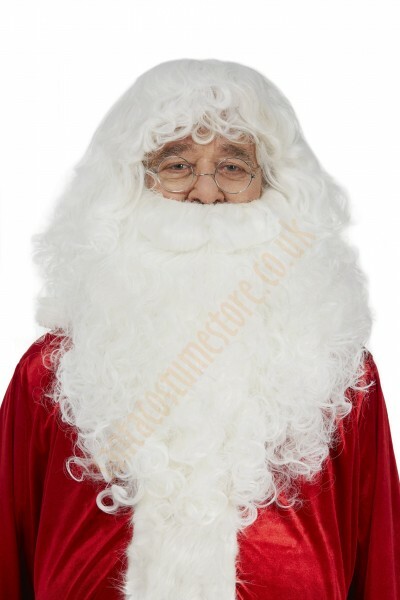 This professional Santa costume is trimmed with warm white (ecru) faux fur (2"/4.5 cm pile), and the band of fur is a lot wider than that on the standard velour outfit – measuring as much as 5" (13 cm) across! The trousers have two side pockets, while the band of fur can be detached to allow for the legs to be easily tucked inside tall boots. One of this set’s parts is an exceptionally long hat with a very big pompon – only available in the super deluxe costume versions (fleece or velour suit). The costume is like and airy, and is excellent for Santas who spend most of their time working in warm indoor spaces. This is the option for the most demanding of Santas – for those who really want to make a big impression on all those who see them! An extra-long beard (15.5"/40 cm in length) is a standard part of the professional Super Deluxe sets, as are the artificial leather boots trimmed with ecru faux fur. 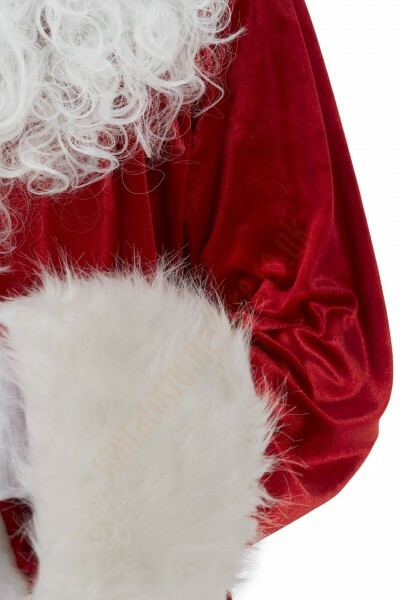 What is included in the complete set with the super deluxe version of the velour Santa suit? 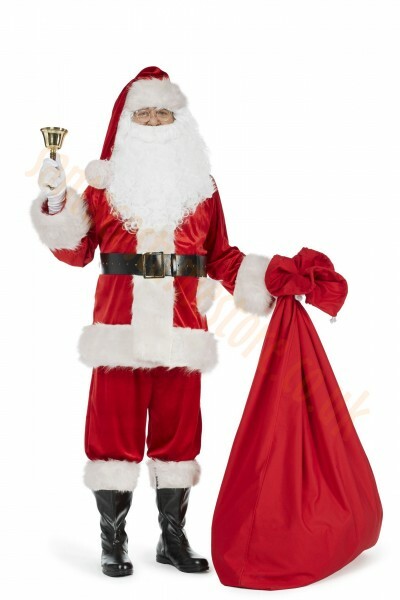 The complete Super Deluxe Santa Claus costume, together super all the accessories, comprises: velour jacket, trousers and super deluxe hat; a long beard with wig and special glue; a black leather belt with a metal buckle; a Santa belly; artificial leather boots; a large sack for presents (measuring 43.5" x 55"/110 x 140 cm); neutral-lens glasses with a case; long white gloves; a huge bell; a red T-shirt; and a garment bag for the costume, together with a hanger. The Santa jacket fastens reliably: the zip, two strong Velcro patches, and belt guarantee that it won’t come unexpectedly undone. Santa’s trousers have two side pockets and are fitted with elastic at the waist, meaning that they can be worn no matter what your figure. The band of fur is detachable (held in place with strong Velcro patches), thanks to which the legs can easily be tucked inside tall boots. The hat is topped with a fluffy pompon, measuring 5" (13 cm) in diameter. 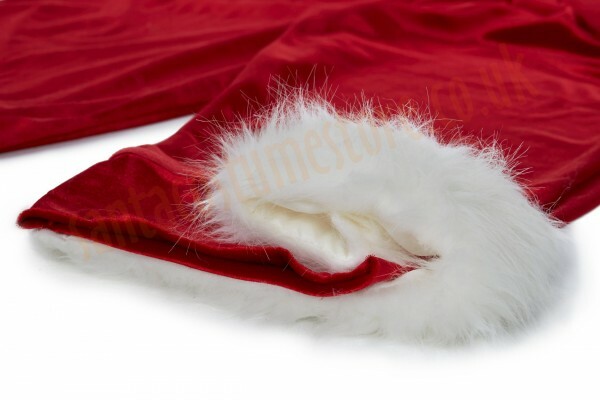 Such an original and unique hat is only to be found in the Super Deluxe versions of the professional Santa suit sets; it is very long (nightcap style), and lends Father Christmas that little extra fairy-tale magic. 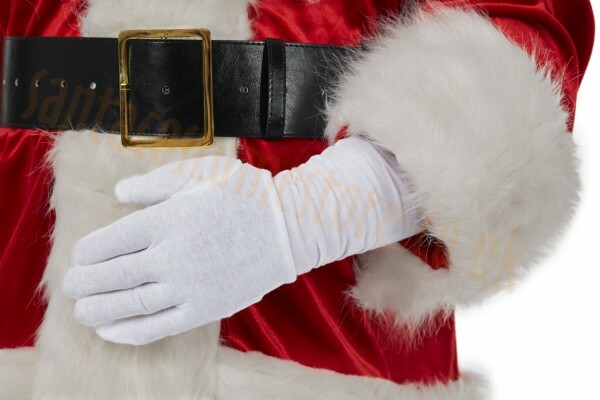 The artificial leather belt completes the Father Christmas costume wonderfully. It is smart and sturdy, and is reinforced with a textile insert inside – making it a highly durable item. 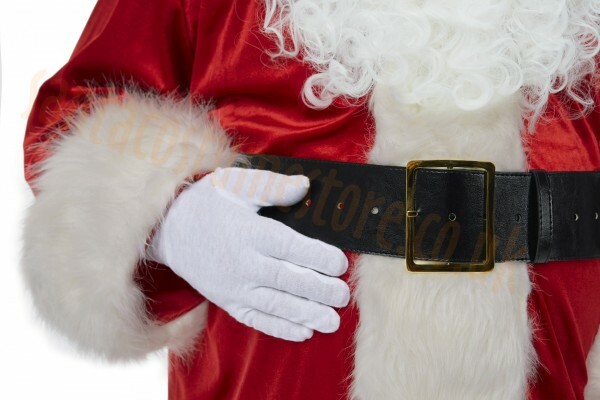 The belt can match Santa’s belly whatever its size (and whether natural or artificial) since at 65" (165 cm) in length it has 26 holes and 2 belt loops; no matter whether the belly is modest or mighty, the belt will definitely fit. 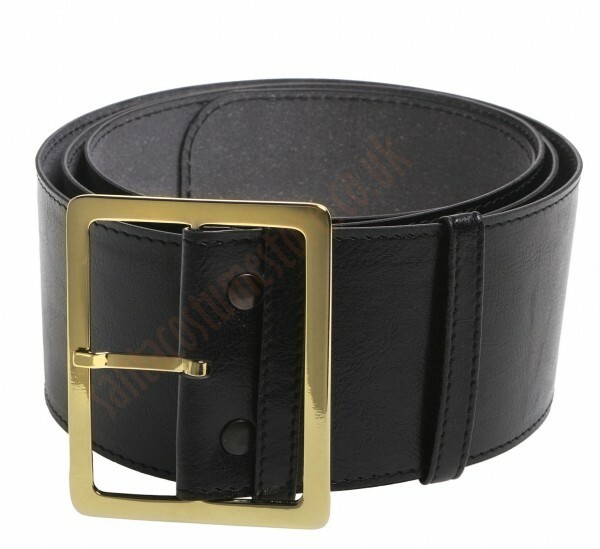 It terms of appearance it is significantly more professional than the ordinary velour belt (also included in the set), unlike which it definitely will not come undone. It is significantly wider (at 3"/7 cm) than a typical trouser belt, and features a wide (3.5"/9 cm) buckle, light-gold in colour – suiting the Santa Claus outfit perfectly! 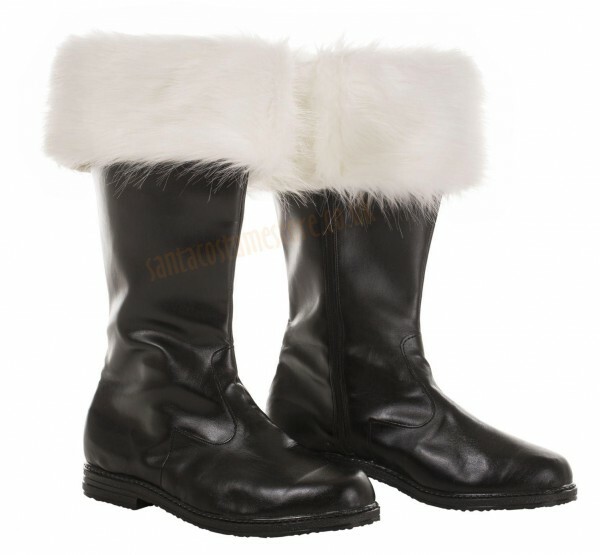 Santa’s black boots made of artificial leather are particularly recommended for those planning to use them frequently. They are very tough and durable, and neither snow nor rain will damage them; there’s no chance of Father Christmas getting cold in them, or of his costume getting wet. The boots are 14" (35.5 cm) tall, and zipped along their entire length – making it easy to tuck the trouser legs inside. The boot legs are trimmed with a broad band of ecru faux fur (the same as that on the Super Deluxe version of the Santa costume), which are held in place with Velcro patches at the zip. 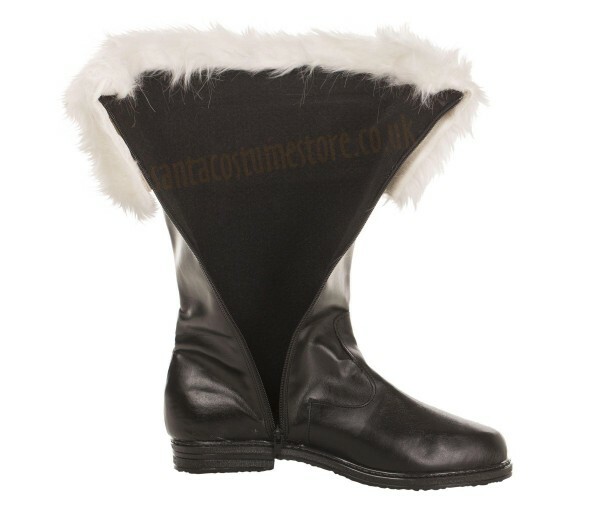 For the more demanding Santas we also have luxury real leather boots, and those preferring to save can choose our velour boot covers; both options come with a colour-matching band of fur. 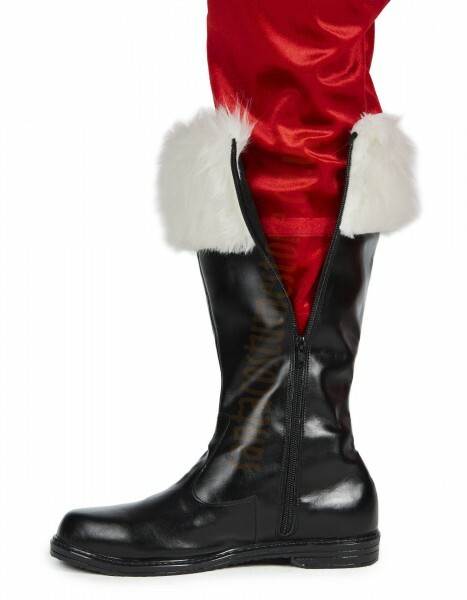 Our leather Santa boots provide a boost to the entire characterisation’s credibility. 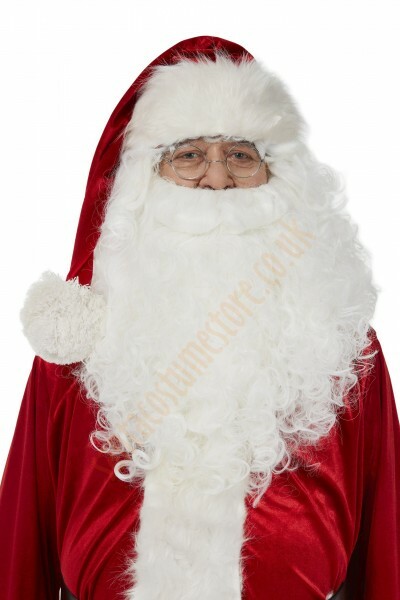 The long Santa beard and moustache comes together with a wig and eyebrows. 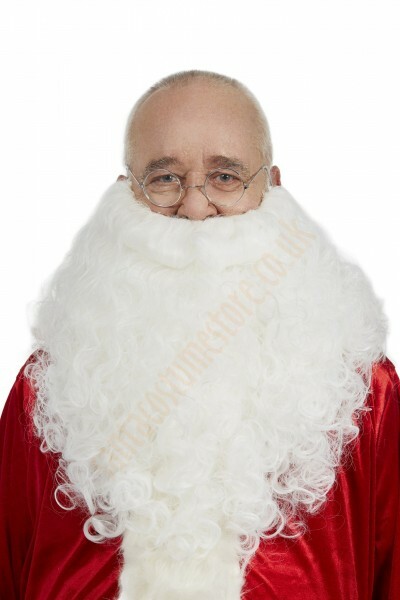 The beard is warm white in colour – the same colour as the faux fur on the Super Deluxe Santa suit – and is 15.5" (40 cm) in length (other beards are also available under Sizes and options). Arranged in soft curls and waves, the beard boasts a natural look. 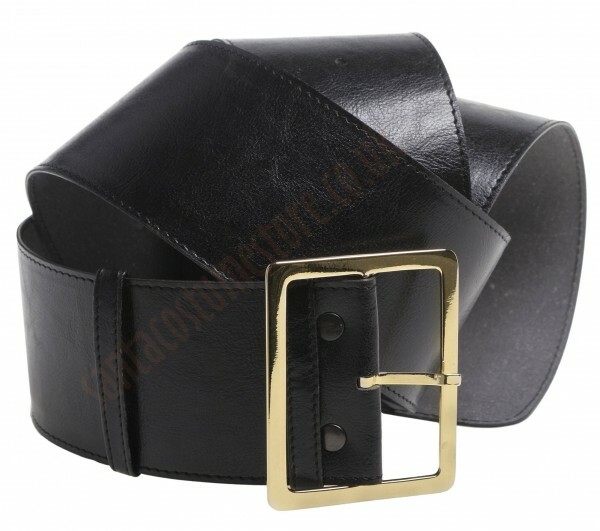 It is held in place with two elastic straps, although the wearer can also apply some special beard glue (in the set). Because the wig reaches Santa’s shoulders, his own hair and ears, as well as the elastic with which the beard is attached, are all thoroughly concealed. The self-adhesive eyebrows add a touch of nobility to the character’s appearance. 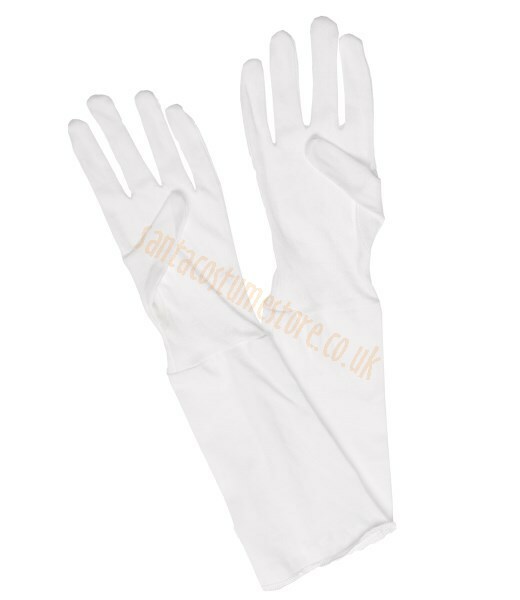 Our cotton gloves, long (reaching a full 7.5"/20 cm beyond the wrist), white and made of cotton, are perfect for keeping hidden any familiar wristwatches or rings. And at the same time they are thin enough for Santa’s hands not to get uncomfortably warm. An important addition to the professional Santa costume. The red T-shirt worn beneath the Santa jacket will make sure nobody – even by chance – sees Dad’s familiar clothing. The T-shirt will also protect the Father Christmas outfit from absorbing sweat. Mad of high quality cotton, the T-shirt features a double-stitched seam, is pleasant to the touch, durable, and doesn’t pile or shrink during the wash. We include a universal size T-shirt (XL) with the Santa suit. 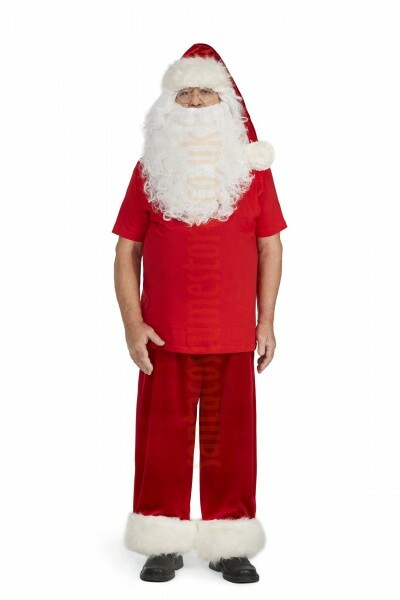 When wearing a Santa Claus costume you’re sure to want to look as believable as possible. 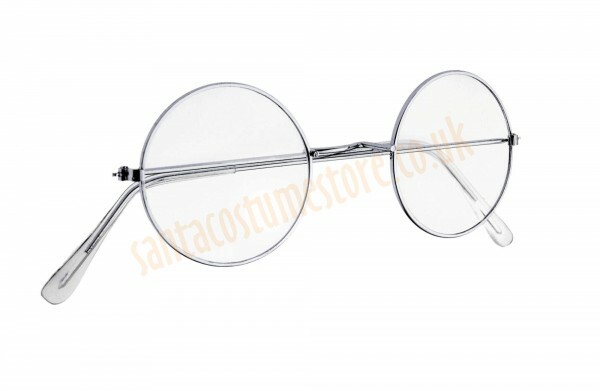 Our metal-framed Santa glasses suit such an image perfectly, and give the character a touch more jovial charm. The glasses are fitted with neutral lenses, which can be replaced with corrective lenses if necessary. 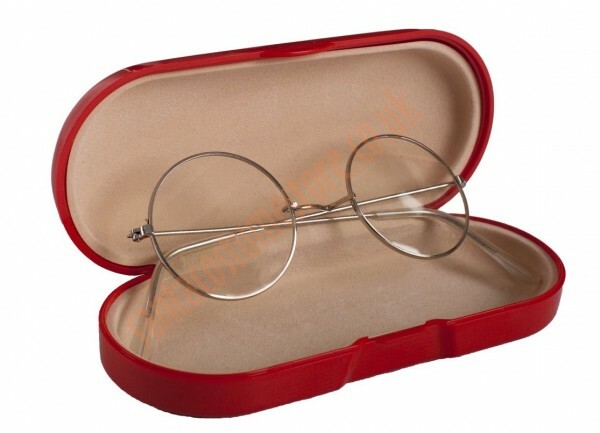 A hard case is included, so you can be sure of your glasses not getting damage (although it may differ from that shown in the photo, it will always be hard and lined on the inside). There’s no need to eat tons of chocolate to take on the role of Father Christmas; in fact, all you need to do is put on an artificial belly, and in just a few minutes you have the posture of the real Santa. It can be adjusted easily thanks to the way it is tied at the neck and the buckle at the waist; in addition it features elastic straps for the legs, to make sure the belly doesn’t try to travel on the job! The velour Santa outfit is breathable, and in addition our Santa belly – with cotton on the wearer’s side – also breathes, all to make sure you don’t come out in a sweat. 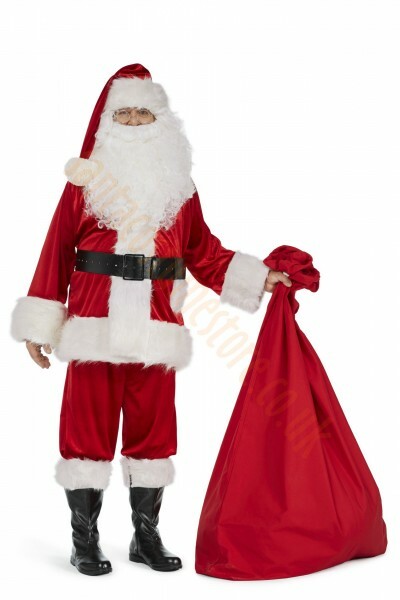 No part of the Santa Claus costume makes children as happy as a large sack – and what it has inside! 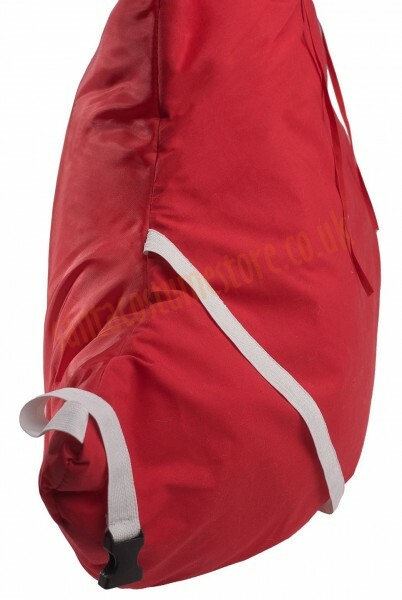 Our tough red denim-canvas sack measures 43.5" x 55"/110 x 140 cm, and features double-stitched seams to make sure it won’t split even when it’s full. There’s also no need for Santa to worry about losing gifts in his hurry, as the sewn-in drawstring won’t let anything fall out. 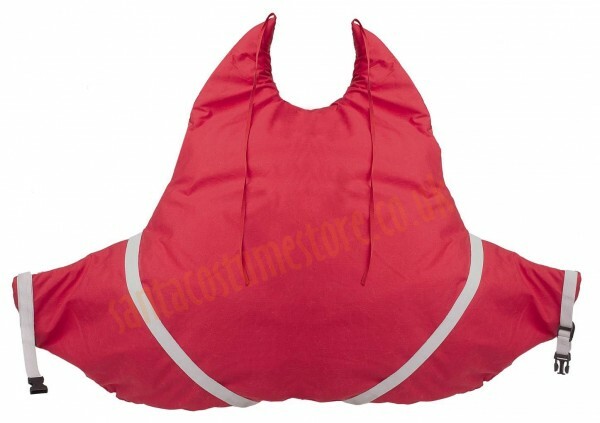 And if the sack happens to get dirty, you can easily turn it inside out and continue to use it as a clean sack! Ring, ring, ring! That must be Father Christmas drawing near! 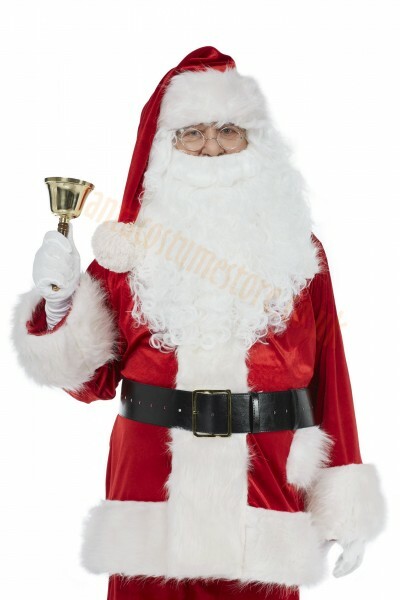 And his arrival is announced with the cheerful and loud ringing of his bell. 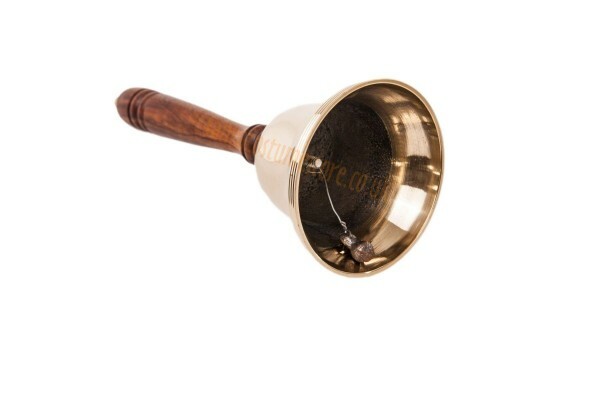 You can hear our huge brass Santa bell from far away; it would be hard not to hear! The largest of the bells we have, this one measures 10" (25 cm) in length, while the base is 4" (10 cm) in diameter (other bells can be chosen under Sizes and options); enough to satisfy true professionals. 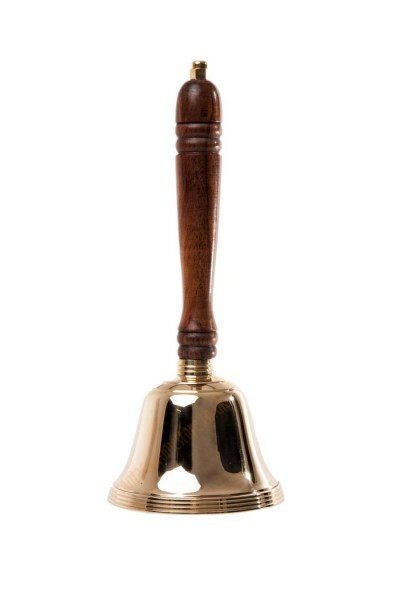 Fitted with a handy brown wooden handle, the bell emits a pleasant, loud ring (you can hear it here). No Santa Claus wants to be recognised, and therefore it’s worth protecting your costume from the curious looks of all those children. 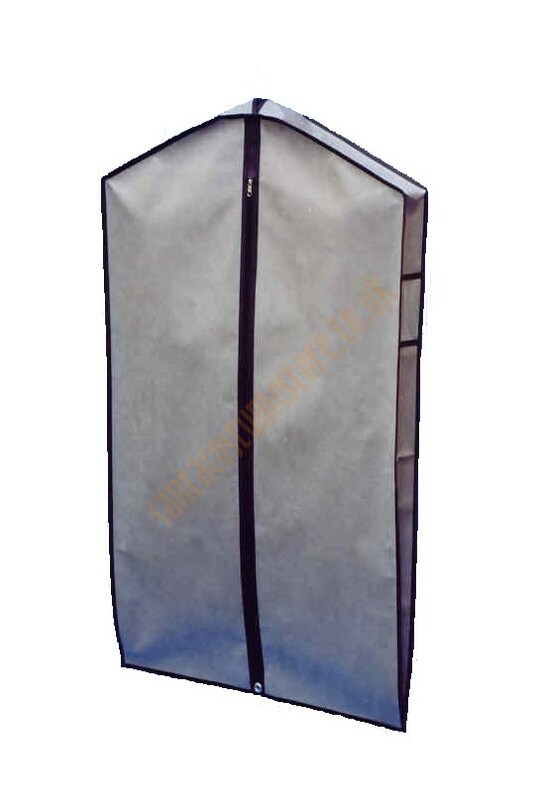 Our opaque, grey garment bag for the Santa suit does just the job. It can hold a complete costume together with its accessories, so there’s no way anything could get lost. 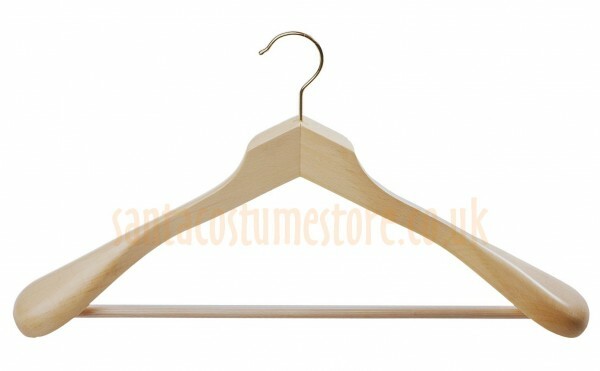 It measures 49" x 24" (125 x 60 cm), and comes with a very durable broad wooden hanger (a cheaper plastic hanger is available as an option). Special beard glue might well come in useful if you’re afraid of children suspecting something and deciding to try and pull off your beard. The elastic straps might not hold out then, whereas using the beard glue will make sure that it stays in place – like genuine beard growth. MASTIX beard glue is gentle on the skin and doesn’t irritate it; to remove it, all you need to use is water or special glue remover. The 2 ml container of glue is enough for about 2-3 uses – and other sizes are available under Sizes and options. The producer gives a 3-year guarantee for the adhesive – although it remains good for much longer. 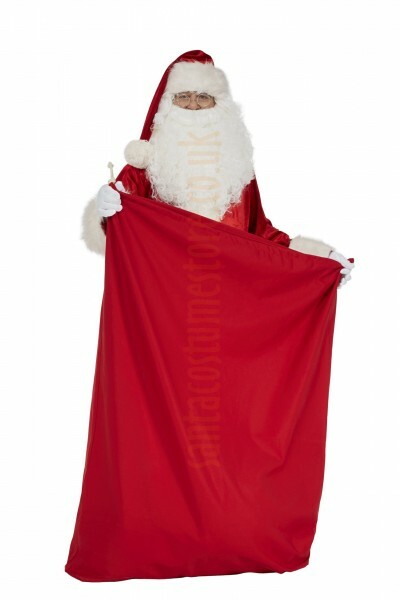 The Super deluxe velour Santa suit – the choice for professionals!